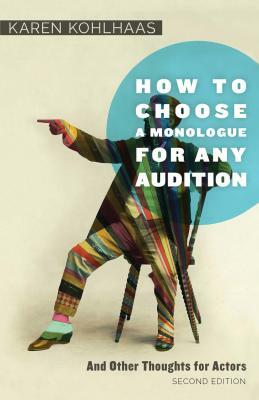 How to Choose a Monologue for any Audition: 2nd edition (Paperback) | The Drama Book Shop, Inc. In the revised and expanded second edition of this essential book for actors, theater director and teacher Karen Kohlhaas describes a thorough approach for choosing the most effective material for any monologue audition, in several easy-to-follow sections. Actors will learn to assess their goals, type, strengths and their dreams in order to focus their choices. Kohlhaas also emphasizes recognizing good writing, which kinds of monologues to avoid, how to thoroughly research an audition and the very best way to find material. The book also enlightens actors from the auditor's perspective by including opinions, preferences and advice from show business professionals and theater educators who have seen thousands of monologue auditions. Also featured are sections on each kind of monologue audition, such as schools and graduate programs, casting directors, agents, theater companies, summer stock, Equity Principal Auditions, and more. The book ends with chapters on choosing monologues to help actors grow, practice new skills and expand their range; and, how to use monologues to help overcome common acting problems and obstacles. KAREN KOHLHAAS is a founding member and director with the Atlantic Theater Company, and a senior teacher at the Atlantic Acting School. She is the author of THE MONOLOGUE AUDITION: A PRACTICAL GUIDE FOR ACTORS which outlines her unique approach to rehearsing audition monologues, and, THE MONOLOGUE AUDITION TEACHER'S MANUAL. She is also the director/creator of THE MONOLOGUE AUDITION VIDEO (DVD) in which Karen and 9 New York Actors demonstrate her monologue techniques, accompanied by commentary from 7 industry professionals. Karen teaches at the Atlantic Acting School, at schools and universites around the country, and in her own private classes in New York City. Her website for actors is www.art-and-audition.com. Publisher: Big and Slow, Inc.